Generally speaking, people don’t think air pollution is a serious problem. It doesn’t seem to affect us personally so we don’t make it a priority. I get it. Life is already hectic enough without having to worry about breathing. However, I’ve lived in places like Wuxi, China. I’ve seen firsthand how catastrophically dangerous air pollution can be. And after living in Korea for years now, I’ve also discovered just how cumulative, migratory, and global this issue is. Unfortunately, it’s time we added air to the long list of things that can kill us. In 2012 the World Health Organization (WHO) estimated that outdoor air pollution contributed to 3 million premature deaths worldwide. Indoor air pollution is even worse, with 4.3 million deaths from attributable illnesses. And the air quality in most urban areas isn’t improving. More than 80 percent of people living in urban areas that monitor pollution are exposed to air that fails to meet WHO quality recommendations. In March of 2017, independent pollution monitoring website AirVisual ranked Seoul’s air quality index (AQI) just behind air pollution heavyweights like Dhaka, Bangladesh and New Delhi, India. In 2014, out of 1,600 cities in 91 countries, New Delhi was at the top of WHO’s ultrafine particulate pollution list. Of course, it’s now only the 11th worst location for ultrafine dust - Zabol, Iran is the current world leader. As the sophistication and availability of air quality measurement technology improves, there’s a growing list of locations appearing all around the world, each one revealing higher and more frightening levels of toxicity than the last. It’s an international phenomenon that’s only beginning to enter public awareness. This is especially true for Korea, where - more and more often - the air is unhealthy for days and even weeks at a time. This is even true in Jeju, somewhere normally thought of as a green paradise. Until recently, Koreans haven’t taken much notice of this because of the country’s long history with dust storms. According to research by Chun Young-sin and associates, the first recorded Korean “hwangsa” event (literally “yellow sand”) was in 174 AD. These storms are born in places like the Gobi desert and ride dominant weather patterns, crashing across the whole of China, Korea, and Japan. These same wind patterns - called the prevailing westerlies - are now also transporting huge quantities of pollution from all over Asia, all to the way to the west coast of the United States and beyond. Aside from the unexpected reach of these storms, researchers like Ginger Garrison have also found that a potent cocktail of chemical and biological contaminants that ride along with them. In addition to gasses like ozone, sulfur dioxide, and nitrogen dioxide pushed along with the dust, you might also find coal ash, mercury, arsenic, lead, and a host of other very serious carcinogens. You can also look forward to breathing increased levels of pesticide, antibiotics, asbestos, herbicides, and PCB’s - not to mention a petri dish of viruses, bacteria, and fungi. It’s a conjunction of natural and man-made effects that turns the air into a toxic sponge saturated with contagion and contamination - and we haven’t even gotten to ultrafine particulates yet. 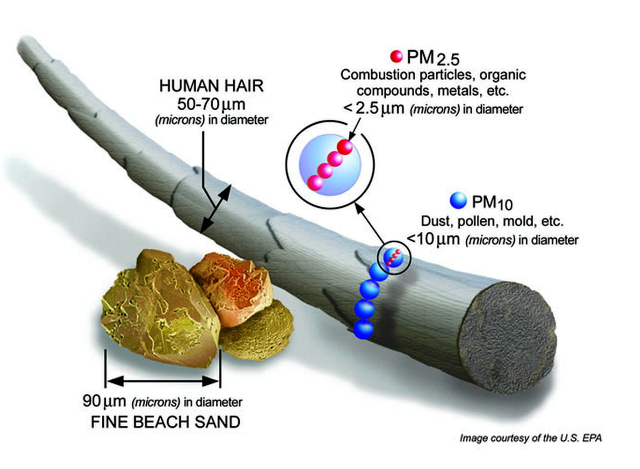 Particulate matter, or “PM”, is usually in one of two categories. Coarse particles, or “PM10”, are between 2.5 and 10 micrometers (µm) in diameter; fine particles, or “PM2.5” (also known as ultrafine or microdust) is anything smaller than 2.5 µm. A micrometer, by the way, is one millionth of a meter. It’s also known as a micron. To give you a sense of just how small this is, water droplets in a cloud or fog are about 10 µm in diameter, and most bacteria are between 1 and 10 µm. You need an electron microscope to see PM2.5. The only possibility of seeing it with the naked eye is when is exists in vast clouds, and even then it can be quite indistinct. It’s so small you can be engulfed in the stuff without ever realizing it. It’s also so small that it can easily bypass your body’s defenses. Your alveoli are small sacs in your lungs where oxygen passes directly into your bloodstream. In an average adult alveoli are about 200 µm in diameter. PM2.5 can be over a thousand times smaller than that. To begin to understand its potential impact on your health, we must first understand what PM2.5 is exactly. In other words, combustion exhaust. From power plants and cars to cooking with gas in your home, modern life is practically built on the daily production of PM2.5. The chemical result of most combustion have a lasting derogatory effect on your health, especially is you consume it on a regular basis. Cigarettes are a perfect example of this - one cigarette is basically harmless. Smoking regularly will kill you. However, while the danger of smoking cigarettes is well known, the effects of air pollution are still largely misunderstood, and even discounted. Symptoms from exposure to ultrafine dust and other PM has, in my own experience, included headaches, sore throat, coughing, sneezing, fatigue, skin irritation, and even canker sores. And while correlation is not causation, I’ve witnessed an unusually high incidence of “allergies, colds, or hangovers” in my friends, colleagues, and students in the weeks after yellow dust storms here in Korea. Everyone feels a little sick, yet there is a powerful resistance to connecting these symptoms with air quality. I’ve even been told on multiple occasions that air pollution actually “makes your lungs stronger” and that it’s only a problem if you’re “sensitive”. Luckily, these kinds of opinion are changing as more and more people have the information they need to recognize the problem and to better protect their health. Like the momentum in public opinion against cigarettes, people are starting to respond to the very real dangers of air pollution. Worldwide, outdoor air pollution is estimated to cause “about 25% of the lung cancer deaths, 8% of chronic obstructive pulmonary disease deaths, about 15% of ischaemic heart disease and stroke, and about 17% of respiratory infection deaths”. “Air pollution is the fourth highest risk factor for death globally,” said Michael Brauer, a professor at the University of British Columbia. In the second half of this story, we will explore how air pollution moves from one country to another, and what we can do to improve the quality of the air we breathe on a daily basis.